A visit to Eifukuchō Taishōken (永福町大勝軒) is a little like a step back in time, to 1955 when the shop first opened, or thereabouts. 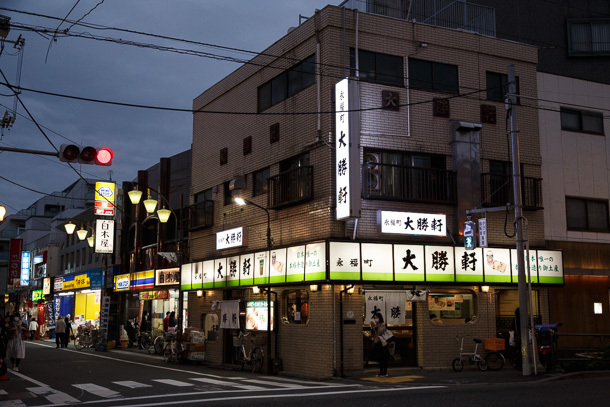 Though the ramen has gone from around 35 yen to 1050 and higher, everything else about Taishōken’s look and feel has more or less held constant as it watched over the main intersection at the center of Eifukuchō through the decades. Accounts describe it as the favorite neighborhood shop of many devoted customers and, for some, the gateway into a lifelong love affair with ramen. 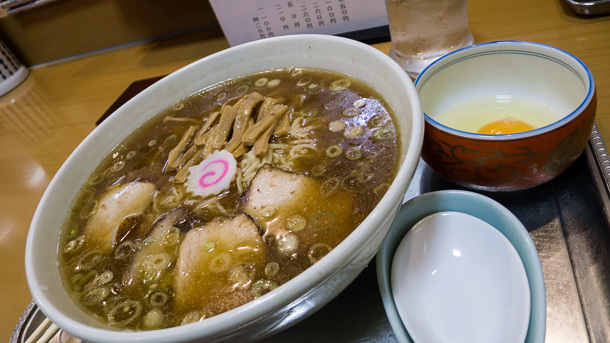 If you’ve followed Keizo Shimamoto’s blog over the years, you’ll be familiar with how the punch bowl-sized serving of decidedly old school Tokyo ramen can become a quasi-religious experience for even the most discerning customers. On a cool autumn night, the warm glow of the green and white back lit sign holds off the dark and draws the faithful to this quiet corner of Suginami Ward. Taishōken sits diagonally across from Eifukuchō Station, at the intersection of Eifuku-dōri and Inokashira-dōri. It also anchors the southern end of the Eifukuchō-eki Kitaguchi Shōwakai. 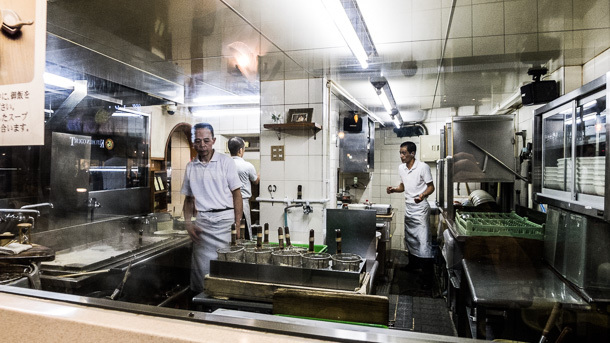 The interior, which includes these huge plate glass windows for a great view into the kitchen, has none of the stylish modern design of the recent trend of cafe-style ramen shops, nor the rustic charm of a gritty, greasy hole-in-the-wall. Taishōken is all about the noodles. And noodles you shall have—lots of them. That spoon is actually huge, in proportion to the equally outsized bowl, so it’s hard to judge scale from a photo. You’ll want to buffer periods of no eating or drinking both before and after you visit. But the generous volume is not a cover for some other deficiency; this is wonderfully pungent, niboshi-based (dried sardine) wafu soup with a shoyu tare. Bits of yuzu, a citrus, add edge and complexity to the smoky, fishy flavor. I got the standard, which comes with chashu, negi, menma and a slice of naruto. Pork fiends can opt for the chashumen, though the amount in the regular isn’t paltry, it’s just dwarfed by the size of the bowl. I’ll add the obligatory warning about the secret layer of floated oil that keeps the soup below indefinitely scalding hot, so approach with caution. I adopted Keizo’s recommendation of creating a mixture of the raw egg with some soup broth and condiments of your choosing as a cooling dip to manage the first tranche of the piping hot noodles. I’m happy to report that I finished the entire bowl without incident. Like many others, though I couldn’t shake the thought that I had just massively overeaten as I rolled myself back to the Inokashira Line, all I could think about later was when I’d have the chance to do it again. This post is part of The Tokyo Project, Volume 2. Click here to go to the introduction and table of contents.